This week was a good turn out week and thanks to Easter feasting, I think, I had about 20 people in every class so far. That doesn't mean they don't look at me like they hate my guts the whole time and have no idea what I want them to do as far as the exercises go, but the more the merrier. My coworker Nicholas keeps promising me that he is going to fill me in on the real deal, that is all the gossip, on the place one day soon. He has intimated to me that he knows what my female coworkers are saying about me behind my back. We were having a good chat in the changing room and then my boss walked in and they started discussing business in a kind of heated way. I didn't understand all of it, but my bosses first line was "If you have such a great memory for names as you are telling K, why don't you even remember to fill out that form I told you about?" . . . By the time I could extricate myself from the situation both men were wearing either European bathing suits or underwear - I can't tell the difference. F wears, like, board shorts to the beach, being a California boy and all, so all of this tighty sometimes whitey stuff is rather startling. As usual, I was the only one wearing clothing in there. Gym life is so weird. I got invited to a dance party by one of my students for next week so I hope my leg heals by then. 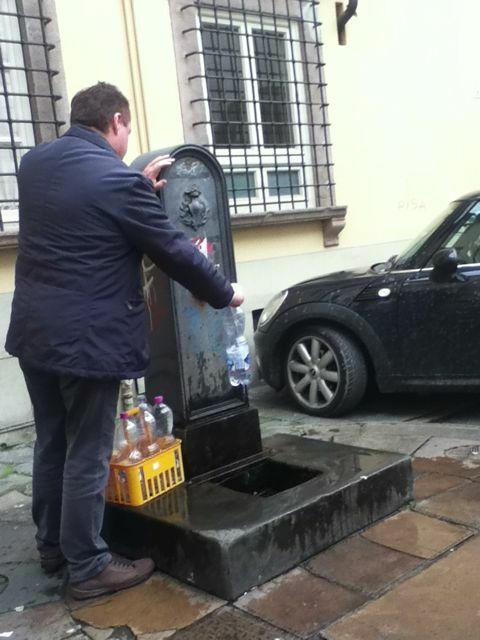 This fountain is our water source, in case you were wondering. 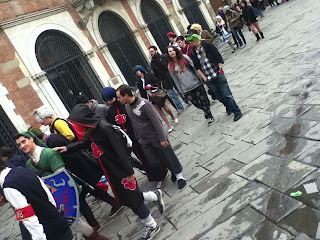 It is not Comix time yet, but it is not unusual to see people in costume marching around Lucca anyway. In the meantime, I am supposed to go and do a massage for one of my other student's veterinarian friend whose back went out. Her back went out and I got her much better within ten minutes -- we had to sneak it in without anyone seeing. I am not allowed to give them to people at work because it is seen as competition with the rehabilitation specialists. She was so impressed that she referred me to a friend who wants to pay me a lot of money. So far he hasn't called though. If he never calls that would not surprise me either. The other day at work I told a coworker about my tendon being torn and he offered to take me to this clinic he knows where they do an electric stimulation therapy. He said he knew someone who worked there and could get me a discount and that he would accompany me the next day. And then he forgot all about it. I never thought that I would be officially useless to T as far as her school work concerns by the time she hit 13 years of age. The math is beyond me now and she says the way I write in English is of no use to her when it comes to what her teachers expect for her essays in Italian. She is beating the pants off me and her father in scrabble played on our Ipod, which has become a family obsession. And we don't even let her win! We try to beat her and then she uses all of her letters on the triple word score! I used to be the Boggle champion and now she beats me at that, too. We have just finished paying taxes in not one, but two countries. Not to worry, our secret plan to make T a scrabble champion, and thus a real contender on the SATs, while earning little enough to make her a contender for college scholarships is going full force. Now if I can just convince them to play these word games in Italian. F taught English a cute group of boys this week who had an earnest and heated discussion about whether LEGOs are in some intrinsic way a source of violence. F recounts that this issue was never resolved fully because Fabio and Duccio could never convince Alessandro that his beloved LEGOs had a nefarious quality. Ah, that's boys for you. Then they grow up and discuss gym forms in their briefs. Legos are a cause of violence only if you step on one in bare feet.